sent does not need latex, libreoffice or any other fancy file format, it uses plaintext files to describe the slides and can also display images. Every paragraph represents a slide in the presentation. Especially for presentations using the Takahashi method this is very nice and allows you to write down the presentation for a quick lightning talk within a few minutes. The presentation is displayed in a simple X11 window colored black on white for maximum contrast even if the sun shines directly onto the projected image. The content of each slide is automatically scaled to fit the window so you don't have to worry about alignment. Instead you can really focus on the content. You can navigate with the arrow keys and quit with q. 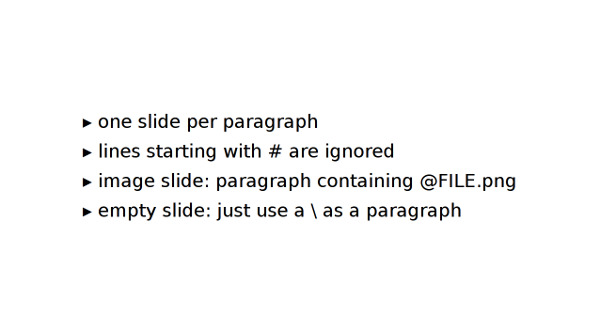 A presentation is just a simple text file. Each paragraph represents one slide. Content is automatically scaled to fit the screen. Images can be displayed (no text on the same slide). No export function. If you really need one, just use a shell script with xdotool and your favorite screenshot application. 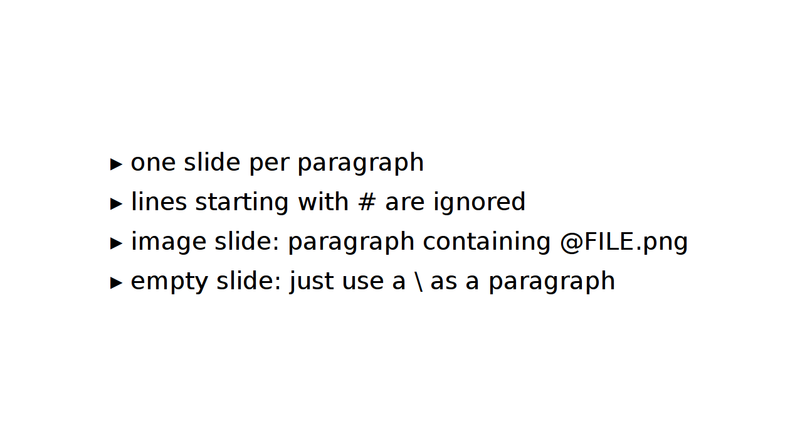 Slides with exuberant amount of lines or characters produce rendering glitches intentionally to prevent you from holding bad presentations. Edit config.h to fit your needs then build again. A deeper example can be found in this file from the repository root.